Hi There! Today, I’m sharing a cute holiday scene card using the 'off-the-edge die cutting' technique. I came across this cool technique on Jennifer McGuire's YouTube channel recently and thought of give it a go. I was totally inspired by her technique! 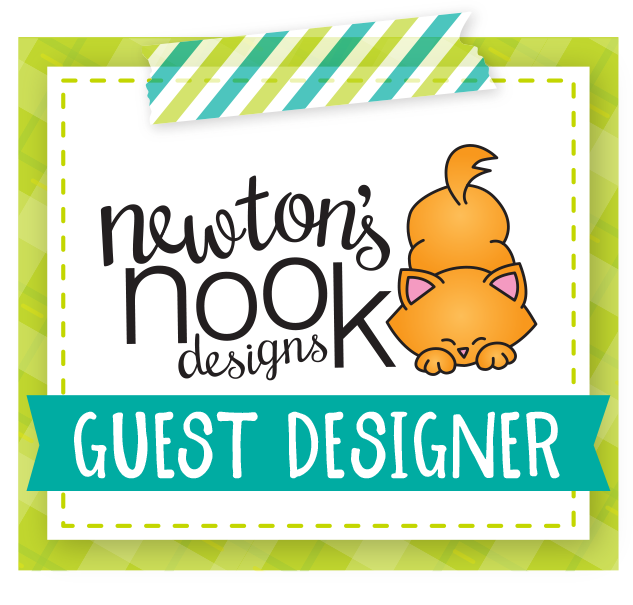 It was so easy to make this card with the help of her step by step, crisp and clear instruction. For this card, I used the little car stamp from Lawn Fawn - Home for the Holidays set and ‘happy’ sentiment die from Happy Lawn Cuts die set. First, I drew a pencil line on a Neenah Solar white cardstock and arranged the dies of the stamp and sentiment. 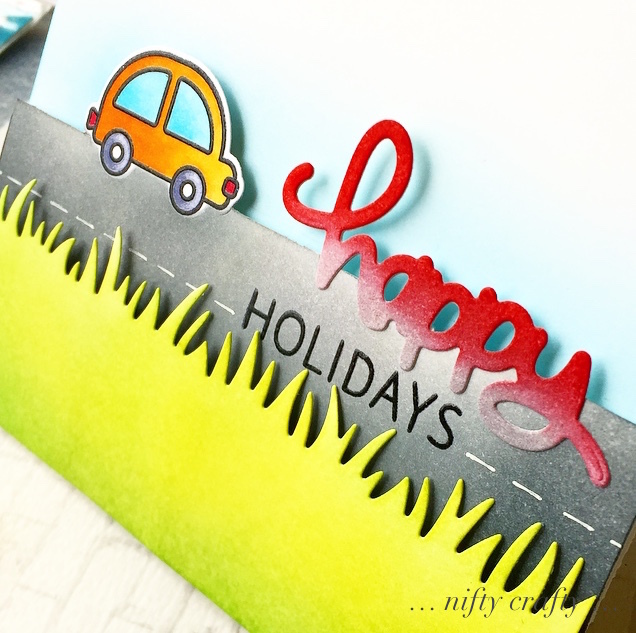 I positioned the car wheels and edge of happy sentiment die right below the pencil line. Then, I placed my cutting plate lined up with the pencil line and run it through my Cuttle Bug machine. Next, I used my MISTI tool to stamp the coordinating car image and colored it with Copic marker. For the happy sentiment, I die cut the sentiment and inked the top with Candid Apple distress ink and Hickory Smoke. I adhered it on the partially die cut sentiment. Next, I moved on to create the road. I masked off the car image and inked up the bottom part of it with Hickory Smoke and Black Soot distress ink. Then, I die cut the grass border using Lawn Fawn - Grassy Border die and inked it up with Twisted Citron and Mowed Lawn distress ink. I pulled the holiday sentiment from Lawn Fawn - Winter Penguin set and stamped it below the happy sentiment. To give a little dimension to the overall card, I adhered the partially die cut card along with the grass border card on to the base card using foam tape. I finished off the card by adding some stitched line on the road using white gel pen. I absolutely enjoyed making this card with this great technique. This is such a fun card to celebrate the holidays with Valliam! 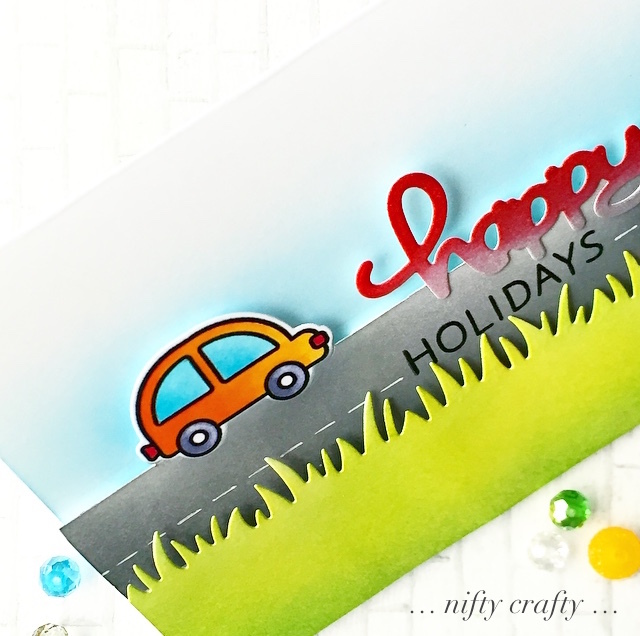 Your partial die cutting of the sweet car and sentiment adds fabulous dimension and the colour details you’ve used to create your road are stunning! Thanks for sharing with us at Just Add Ink this week. Your card is absolutely adorable, Valliam! The fun inking technique you used for the background is so perfect for this cute holiday card! Thanks for sharing with us at Lawn Fawnatics!